Its best viewed in full size obviously! 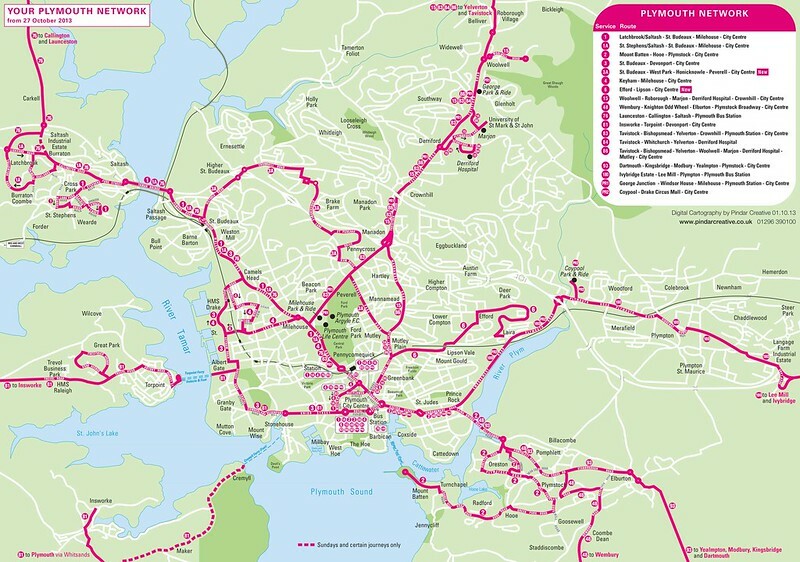 I much prefer this style of map without too many different colours, although, to be fair to Plymouth Citybus, it is probably slightly easier for First having less routes in Plymouth. I will be having a look at other publicity items put out by the companies for the new networks over the coming weeks, but this is a positive start! Public Transport Experience: During the £500,000 scheme the water company will be upgrading 1,025 metres of old three-inch concrete water mains to address the issue of frequent bursts in the area. Random Streets: Houghton-le-Spring a small and historic town in North East England, believed to have been founded in the 12th Century. The route for the 6 seems to be as people expected but it still looks like an odd choice. Are they really going to get many passengers from the bottom of Pike road going to the City Center the long way around, when there is a PCB bus that goes the short way? Are they hoping there are people in Efford who want to transfer onto one of the Plympton services at the flyover? Agreed. A better idea might have been to route a few Coypool P+R services through Laira and Lipson instead. That would have provided a useful second connection to the university; perhaps marginally faster than the current route and creating more of a connected-up network. i dont think you can call the 180 and PR2 "plympton services"! if you take out the infrequent stuff like the 180, 48, 76 and the P&R's the map would look a bit thinner, i think its a bit misleading tbh, also what would the map look like with just evening services on?? Well I can't think of any other reason they would go all the way to the Flyover roundabout to turn around! PCB have registered the cancellation of the 43A with VOSA and a variation of the 5/A with extension to Saltash, from 1 December. If it wasn't for the irregular journeys on the 48, 180, 76 and 93, there would be a lot less pink! Something I just cannot work out with First is that they seem to have a very negative attitude towards their bus routes. In Elburton/Staddiscombe they ran the 5 and 6. Then for some strange reason they cancelled the 5 and rerouted the no 6. I am almost positive that this was very unpopular at the time with their customers, however, the customers needs were ignored by First and eventually Plymouth Citybus stepped in with their 5 and 5A. Now from the end of October there is no First service to Staddiscombe and a limited one to Elburton. First have done something similar with Wembury with the 48 being a daytime only service, financially supported by Devon County and Plymouth City Councils. My point is that First seem to destroy what had previously been good bus routes. This can neither be good for the company and their employees or their customers, which seems a shame to me. Maybe I am being too simplistic with my view and I sincerely hope First can pull back their Devon and Cornwall operation this time? First have been fighting back in Cornwall by taking County Council contracts back from Western Greyhound - to the extent that WG are withdrawing the rest of their Penzance services as no longer viable. Which either gives First an opportunity to put in a few replacement services commercially or leaves the council with more contracts to put out for subsidised replacements. I similar vein First took the evening/Sunday Callington contract back from WG - but WG kept their day-time commercial service going and the 576 now visibly carries more passengers than the 76. For Callington passengers, the 576 route is better as it misses out St. Dominick and both the industrial estate and the town centre in Saltash. Good for who? Bus companies are businesses. They run buses to make money. PCB are carrying no-one in Saltash at the moment so extending the 5/5A will probably not work. It didn't when First tried it with their 5/6 and then with that ridiculous 7E. I saw First 81 from Torpoint today repainted but not with DEVON down the side but TORPOINT instead...perhaps this is the start of First routebranding .. will we see TAVISTOCK on 83, and perhaps EFFORD on the 6 AND HONICKNOWLE on the 3a??? It seems to me Citybus are wasting their money on Torpoint and Tavistock routes.. the blue Flash had 6 customers on today and that's the busiest I have seen it whilst the 86 passed me 5 mins later with about 60 on.. jam packed! Torpoint is even more one sided. Hopefully First will pick up customers in Efford/Honicknowle and Peverell later in the month as well and this will teach Citybus a hard lesson.